Authentic Mexican Cuisine brought to you by Chef Erik Galindo. Galindo's opened in June 2015 and is located in Southgate, Michigan, 14 miles south of Detroit. Although Chef Galindo now calls Southgate his home, he grew up in the heart of Mexico City (Distrito Federal, "D.F.") where his love affair with cooking first began, particularly attempting to recreate the amazing regional favorites. Mexico, and Mexico City in particular, is know for many amazing dishes, but none more beloved than the Torta: a type of sandwich served on an artisan white sandwich roll. Depending on the region, it might be called a Bolillo, Telera, Birote, or Pan Francés. Chef Galindo offers a dozen of different varieties of this remarkable sandwich, in addition to other handmade Mexican classics. Flour tortilla with sauteed peppers and onions Choice: chicken, pork, chorizo, steak or ground beef. Served with rice & beans, lettuce, sour cream and pico de gallo. Flour Tortilla filled with queso oaxaca. Served with rice & beans, sour cream, pico de gallo & lettuce. Flour tortilla with oaxacan cheese, sautéed peppers, onions, tomato, and mushroom. Served with rice & beans, lettuce sour cream and pico de gallo. Flour tortilla with oaxacan cheese,american cheese, pineapple, pork, and ham. 2 Hard corn tortilla, topped with beans, queso fresco, lettuce & sour cream. Served with rice and beans. Corn tortilla chips, soaking in salsa verde. Topped with queso fresco, sour cream & onion. Corn Tortilla chips with melted nacho cheese, lettuce, beans, pico de gallo, sour cream, guacamole and choice of meat. Fresh cut french fries topped with chorizo, melted queso, sour cream and cilantro. Breaded jalapeños stuffed with cheese and deep fried. Served with Baja ranch. Galindo's Salad $9.99 Chopped lettuce, radishes, jalapeños, tomato, onion, cilantro. Topped with grilled steak & tortilla strips. Oaxaca Quesadilla Salad $10.99 Seasoned chicken, chopped lettuce, pico de gallo, queso fresco, cilantro & peppers. Topped with avocado and served with mini cheese quesadillas and chipotle ranch. Side Salad $3.99 Chopped lettuce, cheddar cheese, pico de gallo & tortilla strips. Corn Tacos $7.50 2 street style tacos with choice of meat. Served with rice & beans. Flautas $7.50 2 flautas choice of chicken, ground beef or potato/chorizo, topped with lettuce, queso fresco, sour cream & avocado. Served with rice & beans. Flour Tacos $8.25 2 flour tacos with choice of meat topped with chopped onion and cilantro. Served with rice & beans. Fish Supreme Tacos $8.50 2 Flour tacos with tilapia, lettuce, cheddar cheese, pico de gallo, baja ranch & sour cream. Served with rice & beans. All tortas are served on Mexican bakery rolls, made fresh daily. Topped with mayo, tomato, jalapeños, beans and avocado. Served with fresh cut french fries. Burrito Tradicional $9.99 Choice of meat, oaxaca cheese, beans, rice, lettuce, pico de gallo & sour cream. Served with rice, beans, lettuce & pico de gallo. Cali Burrito $11.99 Flour tortilla, steak, oaxacan cheese, refried beans, guacamole, pico de gallo & sour cream. Served with rice, lettuce & pico de gallo. Santa Fe Burrito $11.99 Flour tortilla, chicken, oaxacan cheese, sautéed peppers, onions, spanish rice, pico de gallo & sour cream. Served with lettuce & pico de gallo. 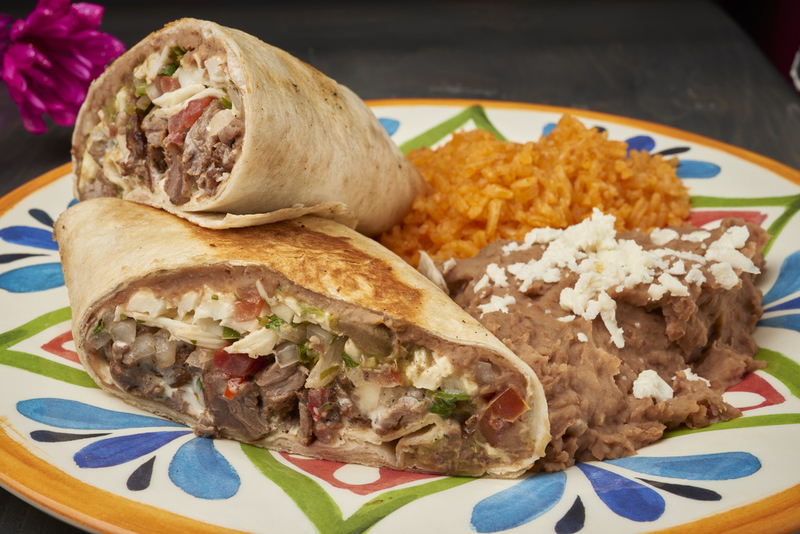 Chipolte Burrito $11.99 Flour tortilla, chipotle steak, sautéed onions, oaxacan cheese, beans & spanish rice. Mojado (wet) Burrito $12.99 Flour tortilla, chicken or ground beef, oaxaca cheese, beans, rice, lettuce, pico de gallo & sour cream. Topped with choice of mild, hot or verde sauce. Served with rice & beans. Combo Plate $9.50 1 tostada, enchilada and street style taco. Choice of meat and served with rice and beans. Enchilada Verde $7.99 3 Corn tortillas with choice of meat. Topped with salsa verde, queso fresco, chopped onion & sour cream. Corn Taco Dinner $8.50 3 street style tacos, choice of meat and topped with chopped onion & cilantro. Served with rice & beans. Flour Taco Dinner $9.25 3 flour tacos, choice of meat and topped with onion & cilantro. Served with rice & beans. Flour Taco Supreme $9.50 3 flour tacos, choice of meat and topped with cheddar cheese & lettuce. Served with rice & beans. Fish Supreme $10.00 3 flour tacos, tilapia fish, cheddar cheese, pico de gallo, lettuce, baja ranch & sour cream. Served with rice & beans. Chili Relleno $12.00 Breaded poblano pepper stuffed with queso fresco & topped with sauce. Served with rice & beans. Milanesa de Pollo or Res $12.00 Breaded chicken or steak served with lettuce, pico de gallo, guacamole, corn tortillas rice & beans. Fajitas $14.00 Choice of chicken, steak or pork with sautéed peppers & onion. Served with 3 tortillas, cheese, lettuce, pico de gallo, sour cream, guacamole, rice & beans. Galindo’s Taco $1.75 Served on a fresh corn tortilla Choice: chicken, pork, chorizo, steak or ground beef. Topped with onion, cilantro, lime and salsa. Taco de Ciudad $2.50 Mexico City style served on a fresh corn tortilla Choice: chicken, pork, steak, chorizo or ground beef. Topped with sautéed pepper, onion, cilantro and fries. Taco de Vegetariano $2.00 Served on a corn tortilla with sautéed peppers, onion, mushroom and queso fresco. Fish Supreme Taco $3.00 Served on a flour tortilla, tilapia fish topped with lettuce, pico de gallo, baja ranch, cheddar cheese and sour cream.